Above: an early view of the Union Chapel (centre) and the former Meeting House on the right. The earlier chapel, against which the bus shelter was built in 1953, now forms part of No 1 Olney Road. The new Union Chapel was built in 1894 on waste ground to one side, together with a schoolroom and vestry. Newcomers to the village might be a little puzzled by the appellation “Union” given to the Nonconformist place of worship. Throughout the past two centuries a happily united body of Baptists and Congregationalists have worshiped in Lavendon. For the greater part of the nineteenth century the chapel, then called the ‘Meeting’, was the building now part of No 1 Olney Road. It stands on the corner and the Bus Shelter is built on its north wall. There was a wall pulpit on the east wall. Entry was from Olney Road, and just inside the door stairs wound up to a commodious gallery. In 1894 the members purchased adjoining waste ground and erected the present building. Schoolroom and Vestry were added in the following year. Grand opening services were held on the 25th June 1895. A small group of Methodists were also worshipping at that time in their chapel in the Olney Road. At the opening of the New Union Chapel the Methodists closed their place of worship and united themselves in fellowship with the Baptists and Congregationalists. For many years the old Methodists building served the village well. It became the Headquarters of a very fine Division of the St John’s Ambulance Brigade. Eventually it was taken down and No 33 Olney Road was erected on the site. On the 16th July 1914, 19 days before the outbreak of World War One, a beautiful 2 Manual Pipe Organ was installed in the chapel by Rest Cartwright Ltd* of London. Incidentally this organ was completely overhauled several years ago and is indeed a lovely instrument. In view of the total independent nature of the Chapel, a new Trust Deed for the order of Church government was established in the year 1927. Incorporated with the new Trust Deed was a Declaration of Faith setting forth the Biblical Doctrines basic to the Worship. A copy of this Declaration can be seen in the Vestry along with two very interesting old posters. Residents and visitors are warmly welcomed at the services, which continue afternoon and evening each Sunday, as they have throughout the past two centuries. Union Chapel is in very truth an evangelical, independent and united fellowship. *According to current research (NBS:June 2010), Rest Cartwright was an organ builder based at Park Road Works, West Green, London. Seemingly Cartwright was christened ‘Rest-in-the-Lord’, in the family’s Puritan Baptist tradition but shortened the name to ‘Rest’ for business purposes. Lavendon Union Chapel, now the Baptist Church, occupies a prominent position in the centre of the village. When the chapel was officially opened at a formal ceremony held on Tuesday 25th June 1895, Mr Thomas Wright who was then officiating remarked that ‘it should be rejoiced that it was placed, not where Nonconformist churches used to be placed, in any back corner, but in the full light of the village in which he hoped it would prove to be a permanent and manifest good’. 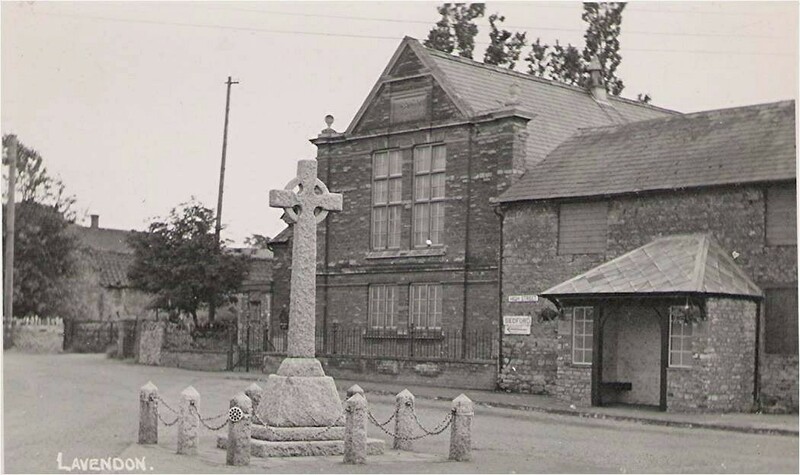 On 20th September 1894, less than a year before the opening ceremony was held, many from the village and elsewhere gathered to witness the laying of seven inscribed foundation stones that remain clearly visible today. This ceremony (which vindicates the chapel datestone of 1894) was the culmination of much effort over many years to raise sufficient funds by means of various events, including concerts and collections, to replace an adjoining chapel building and associated Sunday school. The earlier chapel building was described at the time as being ‘an old and dilapidated structure, unsecure and unsuitable’ and evidently too small to accommodate a thriving chapel community. A contemporary account in the Northampton Mercury records the ceremony: “The day was fine, and a good number gathered in the afternoon to witness the proceedings. The new chapel is closeby the old one, and will be a handsome little structure, with schoolrooms attached. The stones were seven in number, and were laid by the following gentlemen: Rev J T Brown (Northampton), Rev T Arnold (Northampton), Mr J Wright (Birmingham), Mr C Pettit (Harrold), Mr Jefferies (Northampton), Mr J Perry (Northampton), and Mr J Field (Ecton).” It is perhaps curious that seemingly no one from Lavendon itself was entrusted to lay down a stone, though in fairness the Perry family were long associated with the occupancy and operation of Lavendon Mill. Mr Henry Parrish, an ardent supporter, provided the stone to build the chapel from his own stone pits in the village. The newspaper account continues: “After this, the company adjourned to a barn (lent by Mr H Parris) for the purpose of taking tea. The tea tables were richly decorated, and were set out by Mrs Lay and Miss Osborne.” These two ladies were evidently assisted by some twelve others from the village who officiated at the tables. After tea a public meeting chaired by the Rev J T Brown was held in the same place, and there was ‘a numerous company present’ to hear various addresses given by the worthy gentlemen from the top table. “The Chairman said he thought it was about 50 years since he first preached at Lavendon in the old chapel.” The Rev M Joslin of Olney and Mr H Parris of Lavendon spoke about the financial position of the venture which in the event proved to be quite healthy. Indeed, a collection taken on the day reached the magnificent sum of £100, a good proportion of the chapel’s overall cost of £418-15s, including conveyance of the land. Other stirring speeches followed. Also: “Some difference of opinion had been expressed as to whether the schoolroom should be proceeded with along with the chapel, and on the matter being referred to the meeting, it was unanimously agreed to build both chapel and school at the same time.” As a result, sharp-eyed observers passing by the chapel today will see that another five stones were set down on 26th September 1895 as a foundation for the former schoolroom to the left-hand side of the main chapel. These inscribed stones were set down by Miss S James (Wellingborough), Marianne Farningham, Miss M E Bain (Wellingborough), Mrs Anna F Fox (Birmingham) and also Miss C E Wright (Birmingham) on behalf of the Sunday School Children. The speeches continued: the Rev A O’Neill of Birmingham said he was drawn to Lavendon by the fact that so many of his people at Birmingham had come from the neighbourhood and he was glad to get people from the country into his chapel. Finally, the Rev Joslin urged all to make the chapel a centre of usefulness. “He did not like the idea some people had, that a chapel was like a shop, and meant to ‘pay’. He also contended that religion ought to be voluntary, and if religion could not stand without props, he held it ought to come down”. Mr Clayson of Harrold then spoke a few well chosen words and the meeting was concluded by singing the ‘Doxology’ – a short hymn in praise of God. 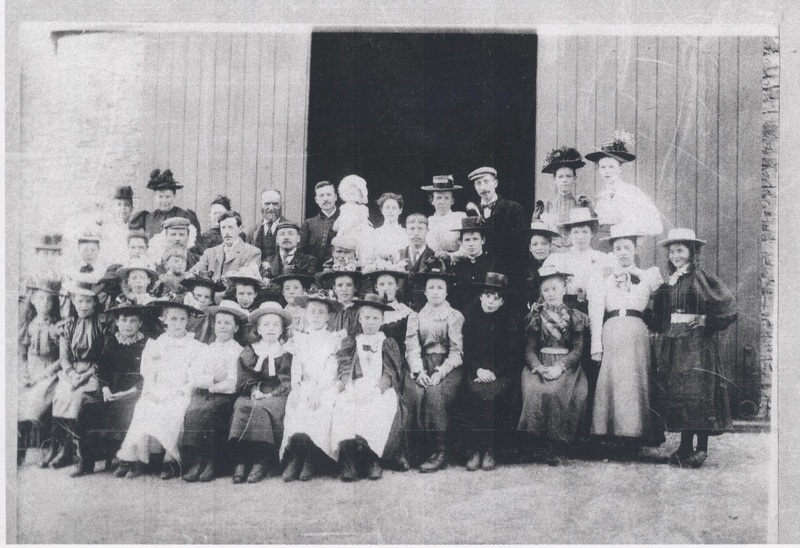 Local Residents Attending the Opening of the Lavendon Chapel – Photo Courtesy of John Panter, whose Grandparents, Thomas and Jane Panter, appear in the back row, 3rd and 4th from the right. In Part 1 above the Chapel Foundation Stone laying ceremony held in September 1894 was described. Nine months later on Tuesday 25th June 1895 the official opening ceremony for the Chapel took place. A contemporary account appeared in the Northampton Mercury as follows. Mr Parrish subsequently outlined a statement of the new chapel’s financial position. With monies received up until the day, together with various donations received during the day including generous donations from several of the dignitaries, the debt on the chapel costs had just that day been cleared. Naturally enough this generated yet more applause from the meeting. Furthermore, Mr W Berrill of London, a cousin of Mr Parrish, had made them a present of a ‘splendid’ American organ and this too generated more applause. After several more speeches and some hymns the meeting drew to a close. The singing had been “efficiently accompanied on the organ by Miss Allen of Olney”. Finally it was resolved to build the schoolroom at once to complete the plan, necessitating a further outlay of £200. The foundation stones for this were evidently laid but three months later on 26th September 1895.